Recommending a world stamp album can be tricky business. Why? Generally a collector looks for the most complete album possible. For obvious reasons, a fully complete World stamp album is almost impossible to find given the number of nations issuing stamps now. Another issue is cost. One of the most complete World albums on the market is the Scott International 60-volume set which retails at approximately $17,393.95. Even at this price you are still not getting an album which is complete and fully illustrated, and it can sometimes be difficult to obtain all the issues. Other brand name albums offer products which can start at around $5000. The best solution for a collector of World stamps is to be willing to expand his/her album with blank pages, extra stamp album binders, and the annual supplement for World albums. In this case, for a fraction of the price you can have a nice album customized to your specific needs. At Arpin Philately we sell a nice selection of World stamp albums. Some are basic and meant to be used as a foundation for beginners. We also sell a more complete album which is, in our opinion, the best monetary value for a more advanced collector. 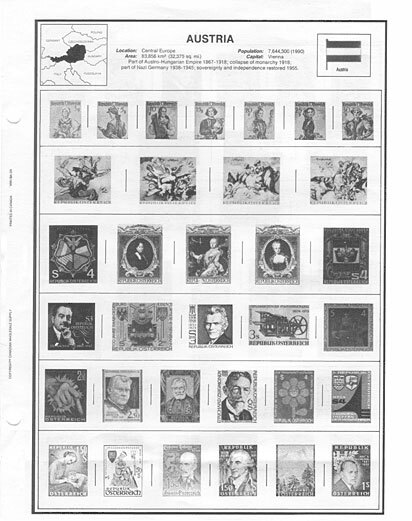 1) World Nations Stamp Album: This is one of our basic foundation albums. It is housed in an attractive heavy-duty 3-ring binder. It has over 500 sides of pages with illustrations. Additional binders, blank or quadruled pages and annual supplements are available. This album will run you about $39.55*. 2) World Phoenix Stamp Album: This one-volume album is a step up from the World Nations since it has 675 pages of illustrations. It also comes housed in a 3-ring binder. As with the World Nations album, you can order more binders, blank or quadruled pages and annual supplements to expand. This album costs $50.55*. 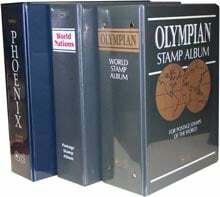 3) World Olympian Stamp Album: This is our suggestion for a more complete album at what is really a very low cost. The Olympian will run you $522.98*. It is a 4-volume album housed in 4″ binders (the binders are 2-post). It has over 4150 illustrated pages and many countries come with a descriptive heading (as shown at right). Most of the countries of the world are represented, but even so, it still only covers a smattering of the stamps the world has produced. However, at this price you are off to a good start and you won’t break the bank. Expansion is also possible by purchasing additional binders, blank or quadruled pages and annual supplements. These items are always readily available. Of course, if you want to purchase a World stamp album other than the ones mentioned above we are happy to oblige. Just contact us to find out their availability and cost. I use to collect when I was a kid and with marriage, family, kids, a full time job etc. my stamp collecting became erratic at best. Now that I am in my 70s I have tried to keep my U.S.A. stamp collection going. I am an avid photographer and enjoy traveling within the U.S. and Canada photographing lighthouses. This past year I was told of the new lighthouse issue from New Zealand. i ordered several sets of the new lighthouse series and found them delightful and decided to begin collecting lighthouse stamps from around the world. I found a nice 4 book album devoted to lighthouses. It was rather expensive, but I needed something to keep these mint beauties in so I bought them. I do not regret it at all. I cannot foresee me buying an expensive world stamp album although it would be nice to have so I could do something with the stamps from sets I buy where I just take out the one picturing a lighthouse. I think a beginning collector of world stamps might be wise to pick one country and begin collecting those stamps or let’s say North American countries with ties to Great Britain. I do not know if it would be cheaper, but the collector would be able to learn a lot about his one or two countries and see the development of the stamps being produced as well as learn a lot of history of the country.